Crushing Defeats… What Purpose Do They Serve? I’m not a big believer in having two people get in a fight… when you know one person is just gonna kill the other person. A few high school girls basketball games have been really ugly and I think we need to put more emphasis on balancing out the leagues then allowing certain teams to get crushed. So I have to ask… what purpose do these blowouts serve for either teams? For nearly two years now Fair Wind Big Island Ocean Guides have quietly been educating hundreds of people each week during free “Manta Talks” held at Sheraton Keauhou Bay Resort & Spa’s manta viewing area. Sometimes as few as a dozen but more often as many as fifty people gather just after sunset to hear about the Keauhou Manta Rays. Fair Wind hosts the free Manta Talks three times each week on Tuesday, Thursday and Saturday. Another ocean activity company hosts Monday, Wednesday and Friday nights. The talks are not offered Sunday evenings. Manta Rays along the Kona coast of Hawaii’s Big Island were only studied in earnest beginning approximately ten years ago. Manta Talks help educate the public about the rays’ habitat and range, the territories they prefer, their intelligence, and why they feed where they do. Photo by James L. Wing. Hawaii is the only state with a law protecting Manta Rays within state marine waters. The law was passed as a way to ensure that these unique sea creatures, in demand for various uses, do not become endangered in Hawaii. According to ocean resource experts, Hawaii is the top Manta Ray destination in the world because of limited natural predators. The law establishes criminal penalties and administrative fines for knowingly killing or capturing Manta Rays within state waters. 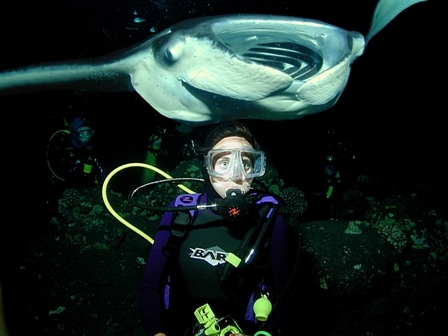 to get close to and observe manta rays. Their huge 12-foot wingspans and agile ballet-like movements are memorizing. With no teeth, they are quite harmless. Manta rays are filter feeders and they feast on tiny plankton as they swoop through the water. Manta rays have a sixth sense that we as humans do not have called electro-reception. Each manta ray has tiny nerve cells on their heads that allow them to sense movement and objects in the water. This allows them to swim inches from swimmers and divers without actually touching them. Pre-Manta Experience safety rules and guidelines by Fair Wind’s professional crew emphasize that snorkelers and divers should never touch the manta but rather relax and enjoy them as bystanders. 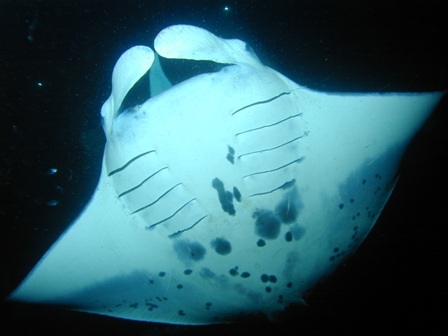 Specific zones for snorkelers and divers are established so as not to interfere with the manta’s nightly feeding. Since 1971, Fair Wind has offered snorkeling and scuba diving excursions to pristine locations along the Kona Coast. Fair Wind’s award-winning tradition of excellence and aloha has earned the company a reputation as the first choice among residents and visitors for ocean adventure. The Fair Wind II, with capacity for 100 guests, is a custom-built, 60-foot aluminum catamaran with covered deck, trademark tri-colored striped sail, two 15-foot water slides, high jump platform, on-board restrooms, grill area, freshwater showers, and a staircase descending directly into the water for easy water access. The more exclusive and intimate Hula Kai, with capacity for just 42, caters to snorkel and dive enthusiasts, going where others can’t. This 55-foot Technicraft hydrofoil catamaran is packed with first-class amenities such as individual theater-style seats for panoramic views during every excursion. Hula Kai also has two fresh-water showers, two rest-rooms and a large commercial grill used to prepare gourmet meals. Visit Fair-Wind.com.